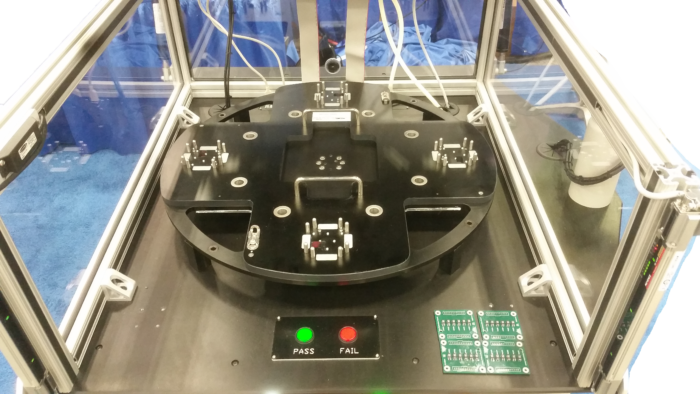 Rotary table handlers are an excellent choice for PCBA or product – level test, programming, part marking, automatic part rejecting, and vision inspection in order to satisfy manufacturing applications that require high throughput. 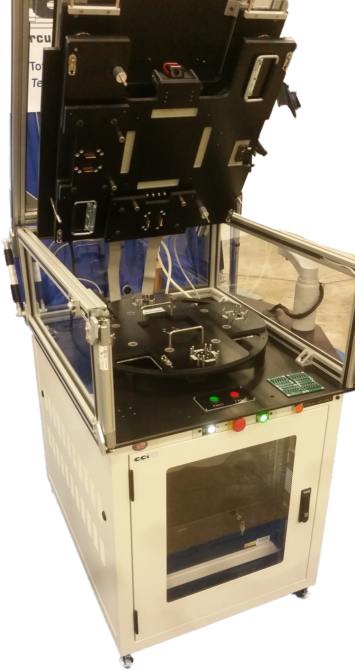 Rotary table based systems used in production can also help reduce the impact of load and unload times for the operator, because the device-under-test (DUT) automatically moves to the next cell within the station as each DUT is loaded. Circuit Check’s 6000 series handlers are modular, scalable and flexible, supporting high-mix and high-volume production needs. A common application example is to configure a 6000 series as a rotary station to perform simultaneous PCBA bar code scanning, testing, programming and marking, in a pipe-line process which improves throughput requirements. The 6000 series handlers leverage Circuit Check’s unique quick-change fixture drop-in technologies to allow for station modularity and scalability. Production line flexibility is achieved because the 6000 series handler is software and hardware agnostic, enabling adaptability to a variety of applications, and is limited only by the number of stations. 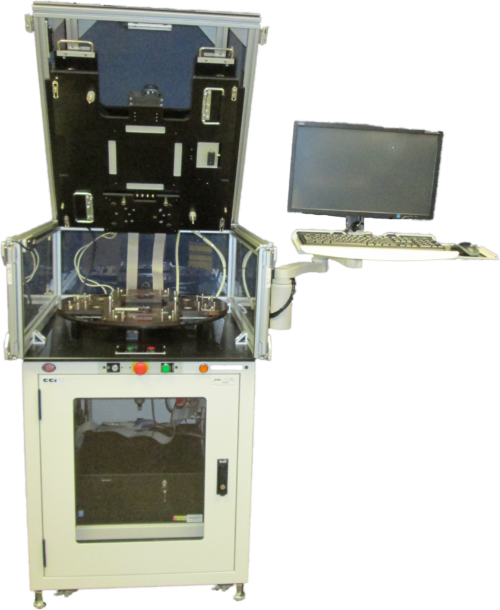 A key to achieving the maximum value from automated test equipment is using the same test equipment and mechanics to test multiple products. Circuit Check’s 6000 Series Rotary Handler achieves this by using interchangeable fixturing plates. These unique quick-change fixture drop-in’s maximize equipment re-use while minimizing the cost for each new test. Drop-in fixtures can perform a variety of functions, such as functional test, flash programming, vision inspection, through-connector test and/or marking. Each 6000 Series handler is configured to customer specific needs in order to maximize performance at a lower investment, supporting many suppliers of functional measurement equipment, marking tools, label inspection and flash programming technologies. In addition, the 6000 series base can be configured with semi-automatic or fully automatic indexing, along with pneumatic, servo or cam-controlled fixturing. More easily align quality with efficiency – Automation integrated with test allows for faster more efficient design of throughput algorithms. Functional tests performed can be evaluated on the basis of detectable faults compromised by line beat-rate. Eliminate possibility of product accidentally forwarded to the next process step, while assuring that the correct failure data is available for Quality and Repair departments – Automation with test allows failure analysis to be logged automatically, while also enabling product to be removed from process flow. Support concurrency by allowing multiple products to be processed at the same time – Automation using a rotary based architecture can save valuable floor space. Address mission critical industries – Automation linked to test can reduce operator intervention allowing for simplified validation to Quality standards. Replace some or all manual labor allowing production operating costs to be reduced.